Welcome to Day 8 of the Twelve Tags of Christmas with Loll & Friends! Loll is such a talented designer and such a sweet person and I feel blessed to call her friend. 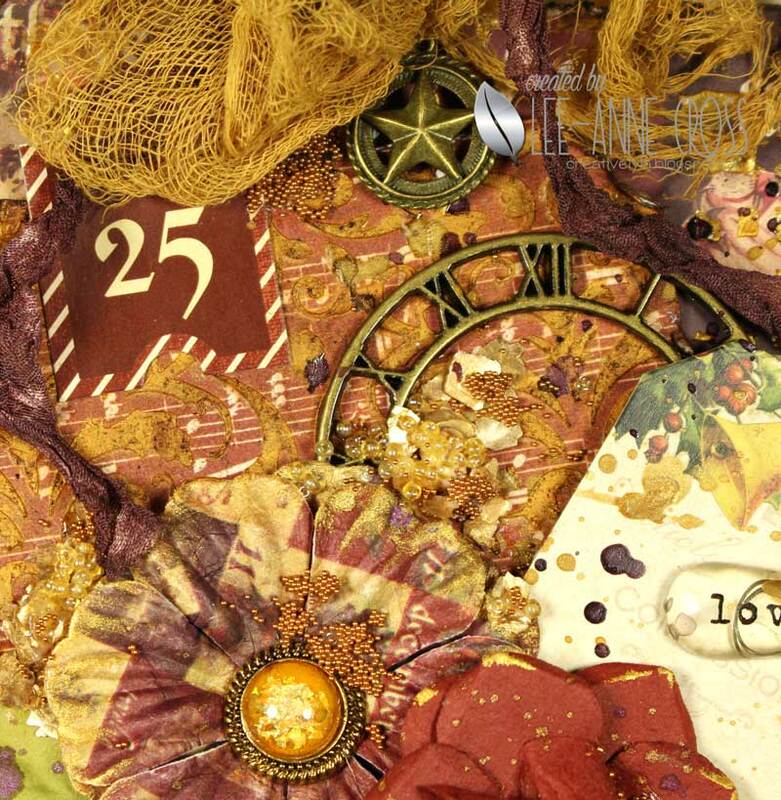 This is the second year for Loll’s tag event with 25 guest designers sharing some mixed media inspiration. If you haven’t been following along with all the tags to this point…check them out here. And there are prizes…yes prizes! Hope you can find some time to enter! I likely should have called this tag “go big or go home”. The base tag is a #12 tag (that’s 5 1/8″ x 10 1/2″). Someone’s going to get a very large gift this year *grin*. The tag was covered in some Prima designer paper and the edges were distressed. Then I added some gold embossing paste through a Prima stencil. The next size tag was treated in the same manner. Once everything was dry, I started putting it all together, again lots of Prima products here…flowers, trim, Finnabair Mechanicals, little tags etc. Then I added some splatters of Prima Color Bloom in two different shades. Micro beads and mica flakes were added randomly for even more shine/bling. I’ve dyed some cheesecloth and some seam binding for the top of the tag and also added a little metal star for the finishing touch. Loll, thank you so much for inviting me to your fun tag event…I’m honored to be among all the amazing designers you’ve chosen! I'd never seen a more delicious looking tag than this, Lee-Anne. I imagined this as an edible tag as I was looking at the close-ups — makes me crave for chocolate or peanut brittle or something LOL! Wow ! There is so much going on in this beautiful tag but I love how beautifully it all comes together 🙂 I will have a hard time pulling off something like this… pretty pretty ! Wow, Lee-Anne! This is amazing! Fabulous details! Oh my Lee-Anne, I didn't know where to feast my eyes first with all the wonderful detail you managed to give us on this gorgeous tag! So beautiful. 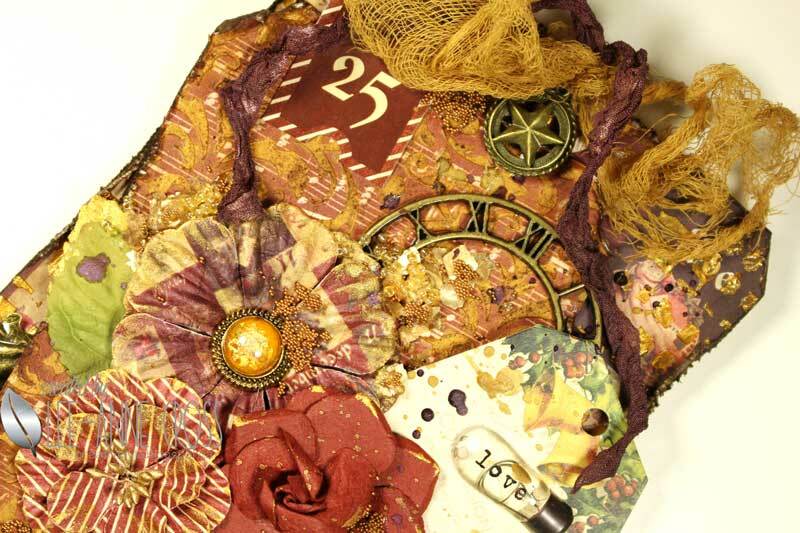 beautiful tag Mix Media! This style is for me a great mystery, and your tag is a unique work. 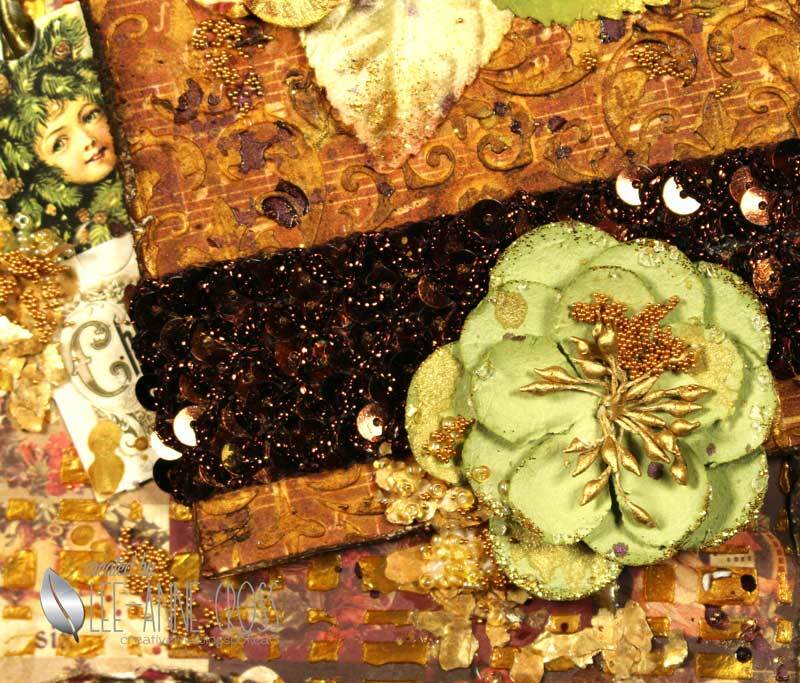 Incredible layering of mixed media – I'm so impressed. And I love the botanical theme! Lee-Anne, your work was always amazing but you outdid yourself on this one! HOLY MOLY! I could stare at this for hours! I could not begin to count the elements you used on this, much less design something like it! LOVE, LOVE, LOVE this! Wow…Absolutely Stunning Work of Art Lee-Anne. You should keep your Artsy Tag as Christmas Decoration either framed or on a palette:-) TFS all your details my friend. Wow ! This looks like a page straight from the Prima marketing group! Gorgeous and beautifully embellished tag! 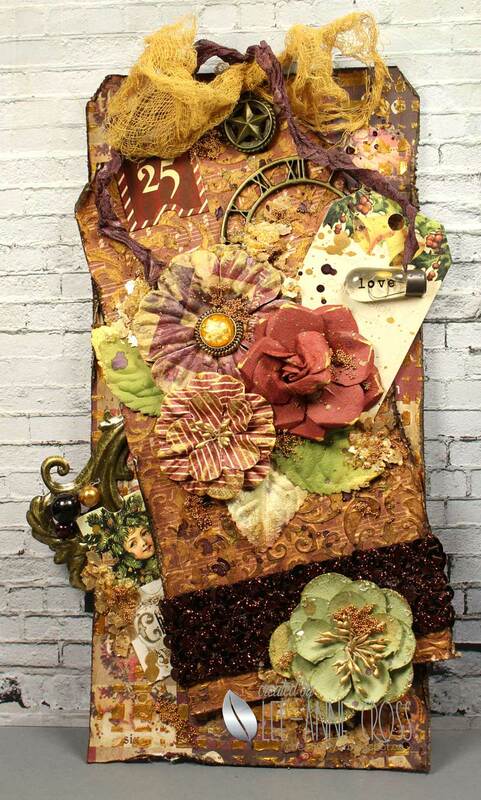 Fabulous mega mixed media tag, Lee-Anne! I just want to touch it!